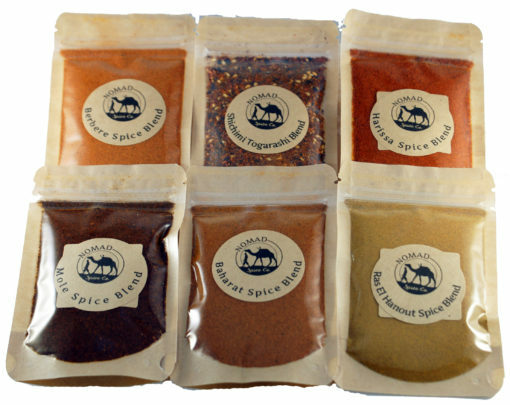 Spice Blends of the World Set | Nomad Spice Co.
From Ras el Hanout to Togarashi, herb and spice mixes are essential to many cuisines around the world. Bringing these blends into your kitchen can lend authenticity to international dishes and provide creative inspiration for your everyday cooking. 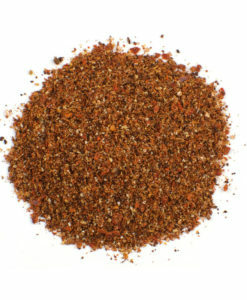 Baharat simply means “spice” in Arabic. However, it’s a widely-used blend throughout the Middle East and Africa. Our handcrafted version of Baharat Spice Blend is a warming mix of sweet, spicy, full-flavored seasonings packed with cumin, coriander and cardamom with spicier ingredients like paprika and black peppercorns for this signature blend. Harissa is a hot chile paste ubiquitous in North African cuisine and made from a variety of spicy chiles. Our blend is crafted from hand chosen chiles (including African Birdseye Chiles), finely ground and blended with other traditional spices to create our Harissa Spice Blend. Mole is a dish served throughout Mexico, based on a complex, carefully developed sauce. Our Dry Mexican Mole Spice Blend combines ancho and chipotle chiles with chocolate and other spices. Our Mole Spice Blend is a convenient, time-saving dry spice blend for this labor-intensive sauce. 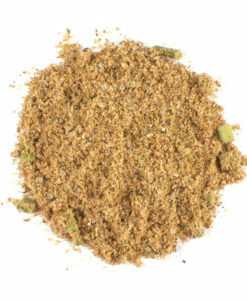 Ras el Hanout is an exotic and complex Moroccan spice blend that contains a multitude of ingredients. 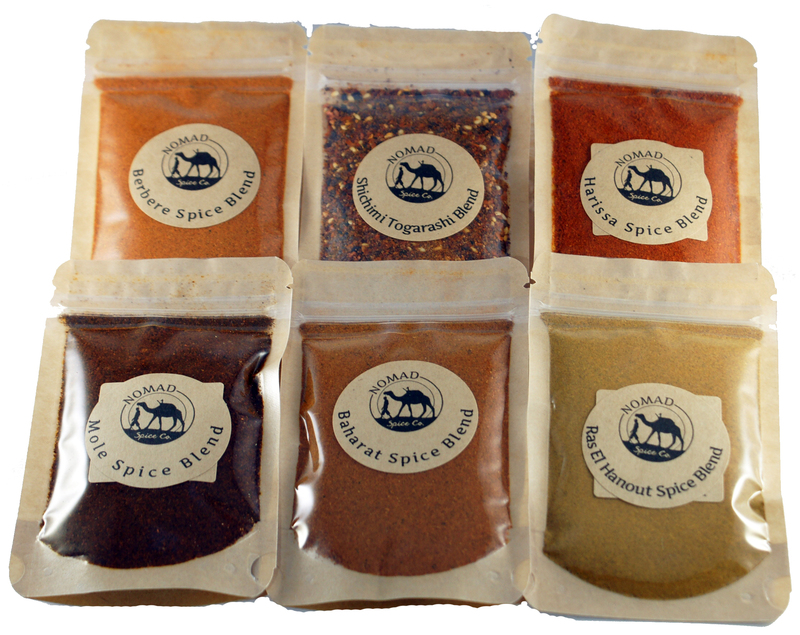 Our blend uses hard-to-find traditional spices as well as turmeric, sea salt and dried chiles. 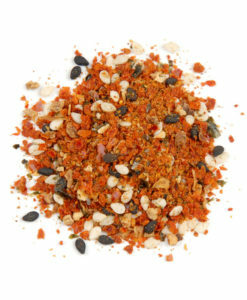 This sassy mix is used to create our spicy, savory Ras el Hanout. 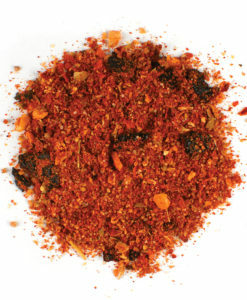 Shichimi Togarashi or “seven-flavor spice” is a traditional Japanese seasoning blending the heat of chiles with sweet citrus flavor and the earthy notes of seaweed and sesame seeds. Our blend is a coarse combination of two chile varieties, crumbled nori, sesame seeds and spices which offers a zesty, fruity and spicy flavor to any dish. Ready for this trip across the globe? No passport required! Let Your Culinary Imagination Run Wild! 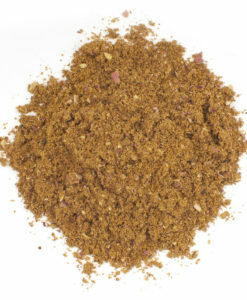 Baharat – Cinnamon, cumin, coriander, cardamom, nutmeg, cloves, black peppercorns and paprika. Berbere – Spices, paprika, salt, cayenne pepper powder, crushed Aleppo chile peppers, citric acid, vegetable oil. Harissa – Dried new mexico chiles, dried birdseye chiles, aleppo peppers, sea salt, cumin, coriander, sumac, caraway, garlic, paprika, salt, citric acid, may contain 2% or less of tomato powder, maltodextrin, red wine vinegar (contains sulfites), food starch modified. Mole Blend – Ground chiles, paprika, brown sugar, spices, salt, cocoa powder, molasses powder (refiners syrup, cane molasses), granulated garlic, and silicone dioxide. 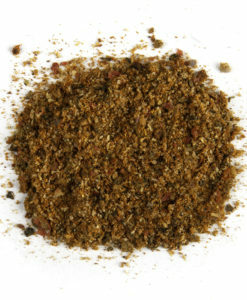 Ras el Hanout – Spices, sea salt, turmeric and dried chiles. 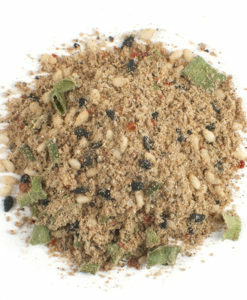 Shichimi Togarashi – Dried chiles, sesame seeds, granulated orange peel, salt, granulated nori (seaweed) and spice.